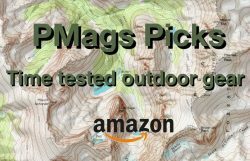 I recently re-posted an article about how to select a good campsite. And I had another article linked that waxed a little poetic about the more subtle aspects of the perfect campsites. But what sites have I found over the years I remember? Which ones stand out as ones I refer to as the campsites I consider approaching perfection? With the exception of a campsite from the Appalachian Trail, none of these campsites were listed in a guidebook. 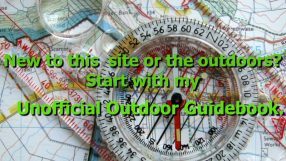 The established campsites were obviously listed on some resource or another, but I typically found the sites initially by using my usual methods for finding a good spot to hike, backpack, camp, or ski. Or sometimes it was happenstance, and I was just tired! Here are some places that I refer to as my “happy places.” Places that I remember fondly. And places that will always be the highlight of my time spent in the outdoors. It was towards the end of my journey on The Colorado Trail. A fall day and the hours were growing short. I needed to make camp. And quickly. I found a spot at the cusp of treeline but still reasonably sheltered in the krummholz. As I was settling in for the night, I saw and heard a bull elk bugling on the ridgeline above. A herd of female elk then ran extremely close to where I was camped. I had this scene all to myself. No elk jams as found in some national parks. No crowds of people. Just me, the herd of elk, and an intense fall sunset over the Colorado Rockies. My 1998 thru-hike of the Appalachian Trail (AT) was five months spent in the outdoors that really did change my life. Before I hiked the AT, I did not envision a life outside of my native Rhode Island. After the AT? I moved to Colorado, learned to ski, went through the slot canyons of Utah, delighted in the New Mexico sunsets, and learned to see where a map would take me. But all those events are because of following that first white blaze in the spring of 1998. And one those most memorable moments from those five months was a quiet campsite on the shores of Jo-Mary Lake in one those rarely found remote places on the AT. It should have been busy. And difficult to find a secluded campsite. Fourth of July weekend in the Colorado Front Range area? Busy as hell. Even in 2010. But I was able to find a little slice of wildness by hiking off-trail and using my map to find what looked to be a good campsite. I was in a cirque. And I woke up to see the mountainside covered with the remnants of the past season’s snow. That morning I sat in the sun, sipped my morning coffee, and simply enjoyed the small piece of the Rocky Mountains I had all to myself. One of my absolute favorite weekends was the time someone and I went to the Nebraska Panhandle. A so-called boring place, we saw striking rock formations, the wonder of experiencing a wide open space, and found a delightful and secluded canyon in the Pine Ridge escarpment. The cottonwoods were blazing and lush in the canyon bottom. A small stream gave a pleasant chill in the fall night air. And the stars above rivaled anything I’ve seen in Utah with its lack of light pollution. Another campsite in an allegedly dull area: The Sagebrush Sea of the Red Desert. The hoodoos and badlands were reminiscent of other more well-known places. But it was the campsite we found off a BLM road that stood out. The sunset over the sagebrush and the bird concerto while sitting in our camp chairs overlooking a wild space reminded me of the site in Maine. Not because of the scenery. Lush, lake filled, and heavily wooded, Maine was obviously nothing like the Red Desert. But rather the stillness, the quiet, and having such a place to ourselves. Everything I seek out of the wilderness was again found in a single location. Mitchell Lake in the summer is an ultra-easy family hike. Nearly flat, about two miles one way, and with enticing views of the Continental Divide. In the winter? 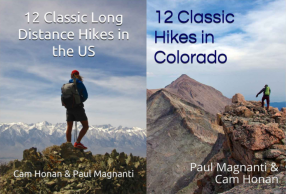 A multi-mile ski or snowshoe with a heavier pack. Some minor navigation challenges once past the wilderness boundary as well. But what is a classic family hike becomes a relaxing winter overnighter. And it has always been me or my friends only when there. Chaco Canyon in the winter was an amazing time to see this unique place. With the right equipment and clothing , the winter landscape was something to be enjoyed and not endured. The mixture of history, cultural importance and the grand scenery in the winter light made me love this place. And want to return again. Be it solo or with friends, there is a campsite in the heart of the Indians Peaks Wilderness that is off-trail and never has people. My buddy d-low and I discovered it by accident one evening. And we both have frequently gone back to the site. The site itself is pleasant, flat, comfortable, and sheltered. But not necessarily breathtaking. It is just a location I’ve stayed at quite a few times over the years. And have some great memories with friends. What more do I need? An unexpected gem of a place. Hovenweep is another Puebloan site. This particular place is located in a remote section of the Utah/Colorado border. If Mesa Verde is the welcoming national park everyone sees and Chaco is the remote, mysterious and awe-inspiring place, then Hovenweep is the corner bar with good food and a good beer menu. A welcoming, laid back, and an area not known as well as other locations. But looking over to Sleeping Ute Mountain and walking near Ruin Canyon of the light of the nearly full moon? Well, that makes the place among my baker’s dozen of favorites. You leave on a Friday night and get to a campsite late. The tent is pitched in a campground with no other people. You both wake up overlooking the Rio Grande Gorge in the early morning light. At night both of you are entranced by the colors of the New Mexico sunset. On Sunday, you leave camp early and head to nearby Taos. Historical art is enjoyed. And you walk the streets of a favorite town. Scrumptious food slathered with green chile is consumed. A cold beer is enjoyed under the cottonwoods of a local brew pub. You don’t want to leave. And it is tempting to call in sick Monday. Is there anything better? Another holiday weekend. All the campsites are full in the national monument that your fossil enthusiast partner wants to see. What to do? Your backcountry atlas is consulted. The friendly rangers confirm that the neighboring BLM land is indeed open to dispersed camping. One ranger even reveals to you her favorite spot. The truck is packed with water, food, chairs, table, and the other accouterments of a self-contained dispersed car camp. A free site is found in the sagebrush away from all others. As the sun slowly sets, a slight breeze picks up, and the smell of sage wafts through the air. Time to make dinner, relax, and feel how lucky it is to have all these wonderful outdoor experiences. As I’ve mentioned before, I enjoy winter car camping. This type of camping combines many aspects of what I enjoy about hut trips but with fewer complications, logistics and with a bit more of a backcountry feel more akin to backpacking. And one of the most memorable of these winter car camping trips was to the Great Sand Dunes over Thanksgiving weekend. The campground was nearly deserted. The few people there also appreciated the quiet and low-key feel of a national park in early winter. We were camped at the edge of the dunes and in the pines. The sun gave off that memorable winter light. The snow-covered dunes and sand reflected that evening light. A scene that will always have a permanent place in my top outdoor memories. In 1996, I took my first, very mistake prone, backpacking trip. But I was hooked. Any free weekends were spent backpacking. When I could not grab a friend one weekend, I went solo. Something apparently people consider foolish and perhaps dangerous even today. I simply did not know any better. Going out do something on your own? Seemed reasonable to me. Still does. It was on the first solo trip where I truly realized how much I enjoyed backpacking. I was camped on a ridge, looking out to one of the most famous sets of mountains in the United States, a slight breeze was blowing, the sun was setting. And knew that I found something that has defined a good portion of my life over the years: The enjoyment of the outdoors. Early fall, East side of Hermit Peak-Pecos Wilderness. A slippery, rocky trail, surprisingly steep, but fairly level as you near the summit. Cool, refreshing water from Hermit Spring-no need for purifying. A cool front with a few sprinkles blows through overnight. Gentle breeze in the pine trees to lull you asleep. In the morning, nothing visible for miles and miles across the northeastern New Mexico plains but a few higher peaks poking up through the clouds below. Dangling your feet off the cliff face while waiting for the sun to appear while sipping a hot cup of tea. Thanksgiving weekend. Watching the full moon rise over the Chisos Mountains-Big Bend N.P. from near the mouth of Santa Elena Canyon where Terlingua Creek empties into the Rio Grande. Turning from the silhouetted peaks to watch as moonlight illuminates the canyon walls like a reverse sunrise. Inky black giving way to countless shades of grey as the inner gorge is revealed. Absolute silence. Waking up the next morning and skipping rocks across the river from one country to another. Allo sounds lovely. Thanks for sharing! I love the Pecos Wilderness. Northern New Mexico is one of my favorite places. Someday I’ll make it to Big Bend.